The Sainsbury Archive documents the history of the Sainsbury’s supermarket from its foundation in Drury Lane in 1869. It also holds a unique record of the transformation in retailing since the mid-19th century, and the impact that these changes have had on society. The aim of the website is to showcase and exhibit this fascinating archive and make it accessible to all who might be interested. 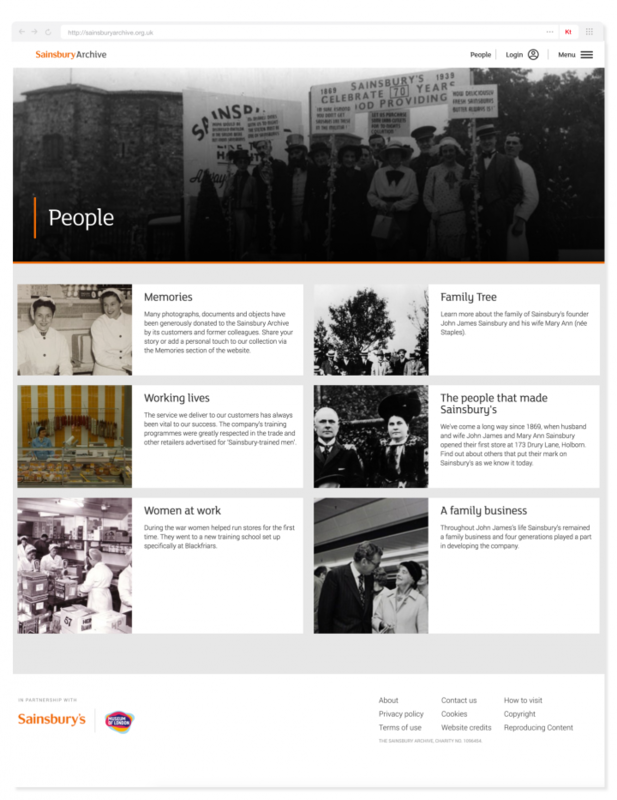 The homepage has been designed to bring to the forefront the imagery of the archive. 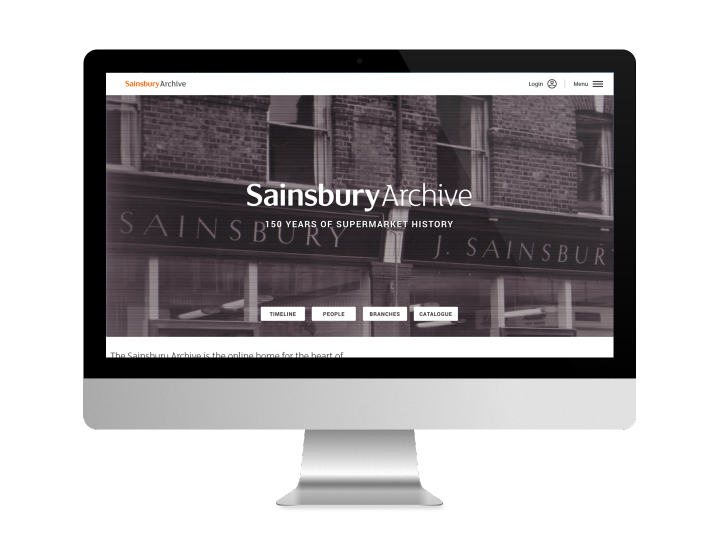 It signposts clearly to the various component parts of the website, including a timeline of key events, the people who made and make Sainsbury’s, a historical map of branches, and of course the archive catalogue. People are what have made this supermarket, and what will continue to make it. 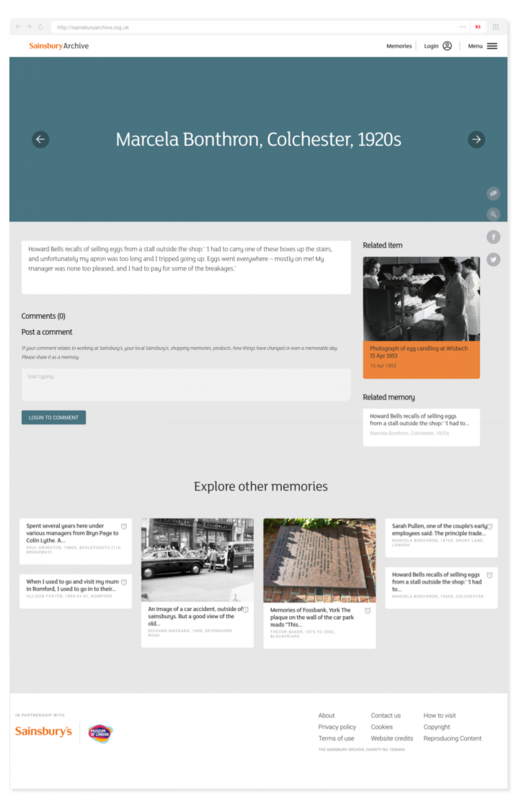 This sections brings stories and particular people to the attention of the browser, and showcases their contributions. 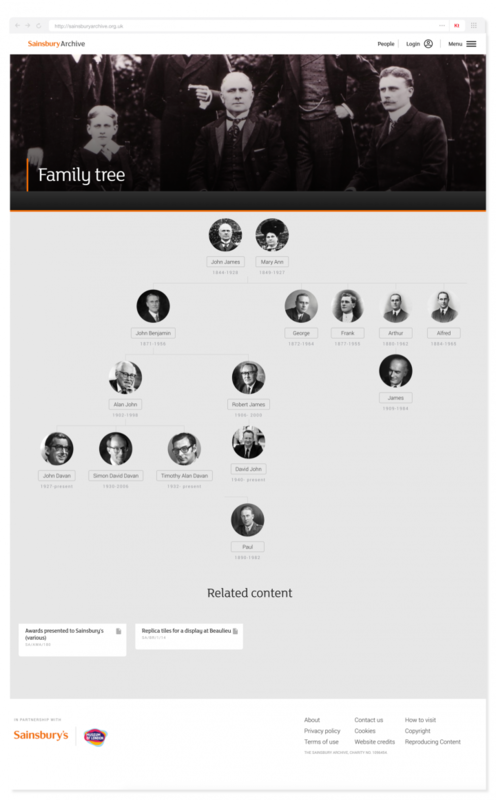 The history of the Sainsbury’s family is integral. An interactive family tree allows the visitor to explore, and see the way in which the family behind the name have worked with the supermarket from the start right up to the present. Sainsbury’s has stores, offices, and warehouses all over the country. 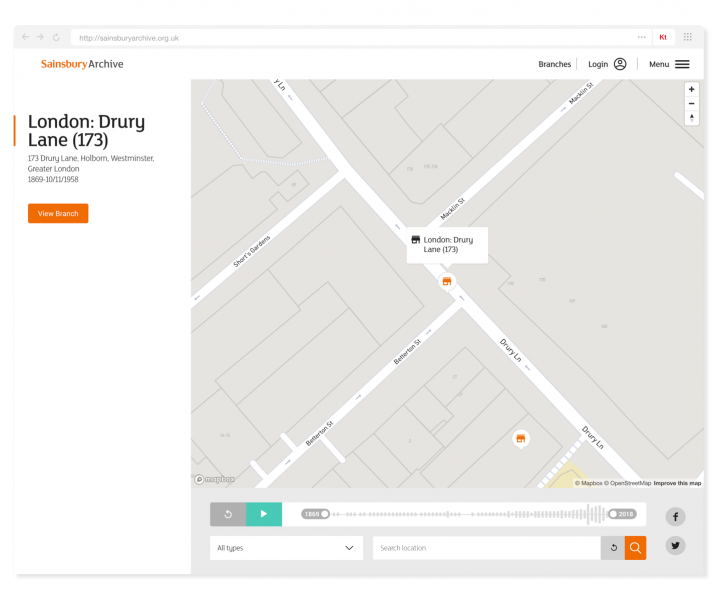 Its expansion and spread are explorable through an animation, and a user can also search the map for any store or location that might be of interest to them. 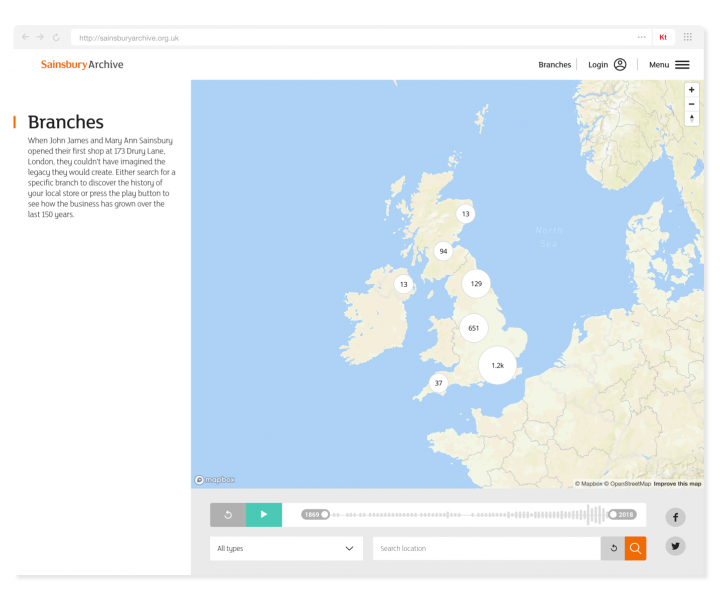 A website visitor can search the catalogue or browse the items through highlighted objects (selected by the Sainsbury Archive team) or through the hierarchy tree of the archive. This adds extra ways in which the archive can be accessed by the visitor. A single object contains a selection of details about the single catalogue object, along with any images of it that there may be. Users are able to zoom into the images and rotate them. They are also able to interact with the object, adding a memory about it, reading others’ memories, or adding the object to their own personal albums. The single object also has easy access to the archive hierarchy tree. Users are therefore able to navigate between items and folders. 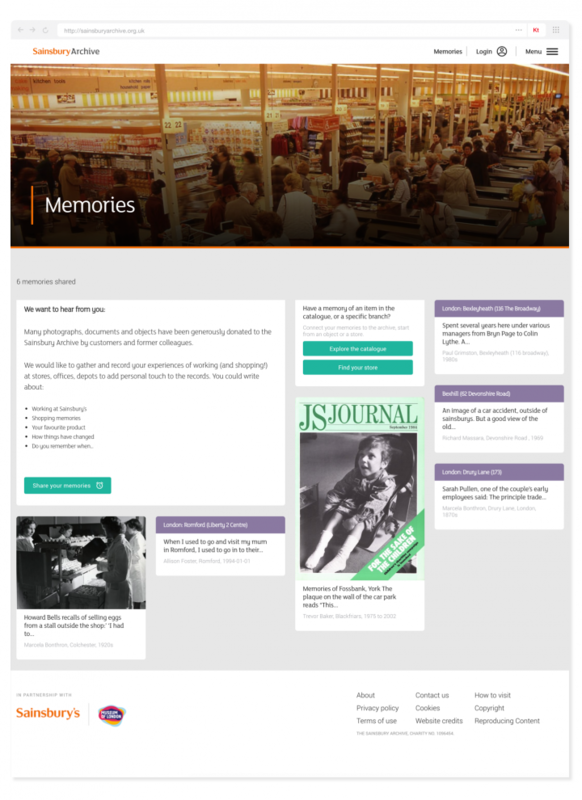 When a user adds a memory (which could be about a branch, an object, or a generic memory about the supermarket), the Sainsbury Archive team are notified of the entry through an email about their Qi. They can then review it, and approve the memories to appear on this page. The single memory shows the object the memory is assigned to, as well as any related memories. If the user has submitted an image alongside their memory, then that will also appear on this page.